Do you ever try a recipe that sounds delicious and end up totally disappointed? Not that the finished product is bad, it’s just … underwhelming. This is doubly unfortunate if you are testing said new recipe on a dinner guest (I almost always use my dinner guests as guinea pigs. As of the publishing of this article, none have ever complained about this practice). Last night I had a friend over for dinner and had just that experience. 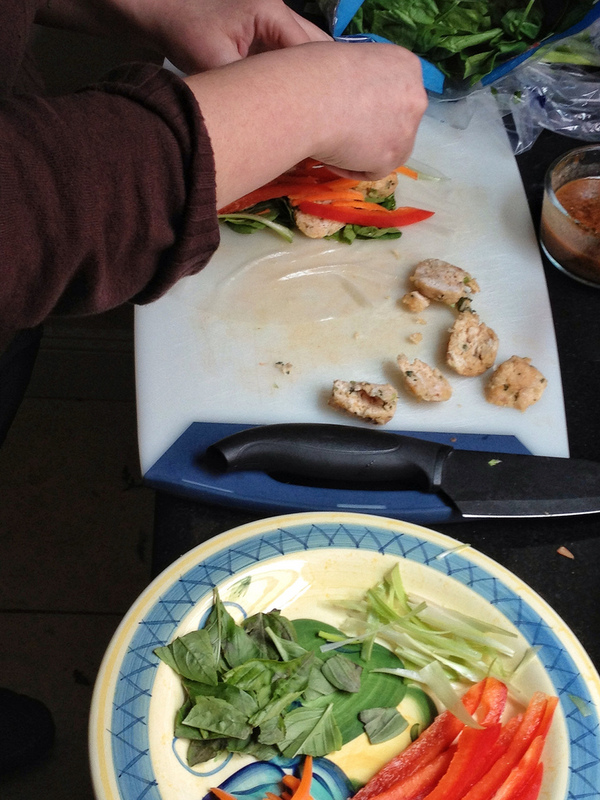 I made Thai basil turkey meatballs with a spicy garlic dipping sauce and … we were less than impressed. They were edible, and we weren’t hungry anymore afterwards, but I wasn’t really looking forward to finishing them up. This is where the story gets good. For lunch, I ended up repurposing these sad, bland meatballs and overly salty sauce into something beautiful! It turns out that spring rolls are the easiest thing in the world to make, once you discover the knack to rolling the sticky rice paper. I layered the sliced meatballs into the rolls with spinach leaves, carrots, bell pepper and green onions cut into matchsticks, and torn up basil, then drizzled all of it with a little of the doctored sauce and rolled them up. My friends, the finished product was so much greater than the sum of its parts. I’m giving you a doctored recipe for my original meatballs and sauce, but please don’t limit yourselves to using meatballs! Slice up some baked tofu, sautee some shrimp, grill some teriyaki chicken. 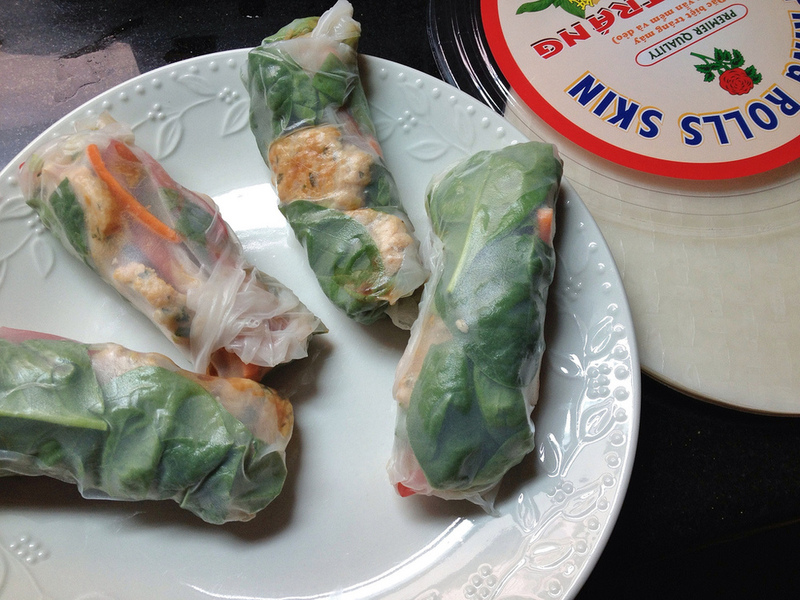 Just please, please buy the wrappers (they’re usually by the soy sauce at the grocery store - I bought these at Target, they are not hard to come by) and make some healthy and delicious spring rolls! Preheat oven to 350 degrees. Mix together all of the ingredients and form 1” meatballs (this is so much easier if you wet your hands slightly before working them into balls). Place meatballs on lined baking sheet and spray or brush lightly with olive oil. Bake them for 12-15 minutes, until they’re cooked through. Serve drizzled with sauce alone, or use the below recipe to create spring rolls. Whisk all ingredients together, then bring to a boil briefly before simmering until it thickens slightly. You want it drizzle-worthy; add more hot water to thin if needed. Slice the cooled meatballs, along with carrots, bell peppers, basil, and green onions -- whatever fresh vegetables you happen to have on hand. Heat up sautee pan of water until it is hot, but not so hot you can’t touch it. Quickly and gingerly dip the dry wrapper into the hot water until it is sticky and soft - it is hard to handle at this point, so it might take you a couple tries to do it. Don’t worry, even if the wrapper folds in on itself a little it is still tasty! This took me 3 or 4 one-second dips into the water. Let the excess water drip off and lay the softened wrapper on a plate. Lay down a bed of spinach, the meatball slices and vegetable matchsticks, as well as the torn up herbs (cilantro would also be great instead of basil). Drizzle a little sauce over the innards and roll in like a burrito: fold the top and bottom flaps of the circle slightly over the filling, and then roll on side toward the other until you have a wrapped roll. Serve cold with more of the sauce. Eating the rolls is the best part!